Google recently published some advice for local businesses on how to be more visible when people do a local search for what you do. Proper SEO for your website is essential of course, but there are some other specific things you can do to make sure people find you easily when they do a local search on Google. 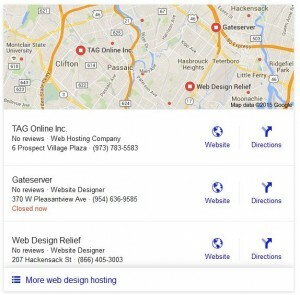 Google relies pretty heavily on your listing in Google My Business and offers some suggestions on how to make sure your listing there is optimized for local search. These suggestions will help you show up higher in the organic listings and will also improve your odds of showing up in the Local 3-Pack. Add or claim your business — Google has video instructions. 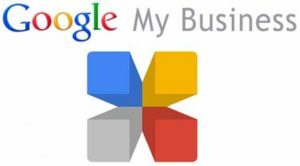 Enter complete data — fill out as much as you possibly can of all the information Google My Business accepts: your address, phone number, category, and more. Verify your location — again, Google has video instructions. Include you business hours — be sure to include any special hours for holidays and the like and keep them current. Add your logo and photos — they help attract visitors to your listing, and can help them understand how you provide what they’re looking for. Manage your reviews — encourage delighted customers to leave reviews, and be sure to respond helpfully to any negative reviews promptly. We have some advice on that. 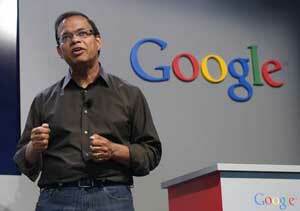 How to improve your local visibility, according to Google. We’re talking about keywords here; the search terms your customers are using to find what you offer. 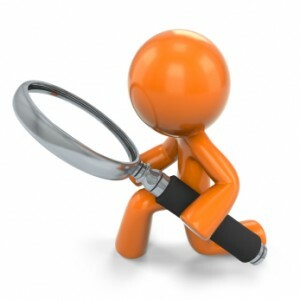 Keyword research, analysis and selection should always be an integral part of any SEO program. Make sure there are pages on your website that are clearly about the most common and most important search terms. Also make sure your pages include your location address. 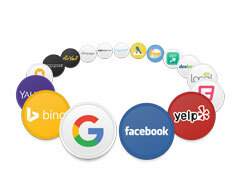 Be sure to use them in your listing on Google My Business and any other local sites. In a local search, distance is very important; we are talking about local search, after all. Always specify your location, and be sure it’s consistent every place you’re listed. If you don’t see customers at your location but provide your services at their locations, you can specify that so your street address doesn’t display and send unwanted visitors to your home or private office. This has to do with how well known your business is. Google bases this on your organic rankings from SEO and on information Google has about your business from all across the web: reviews, links, and local directory listings. One approach we recommend to our own clients is a PowerListings subscription. 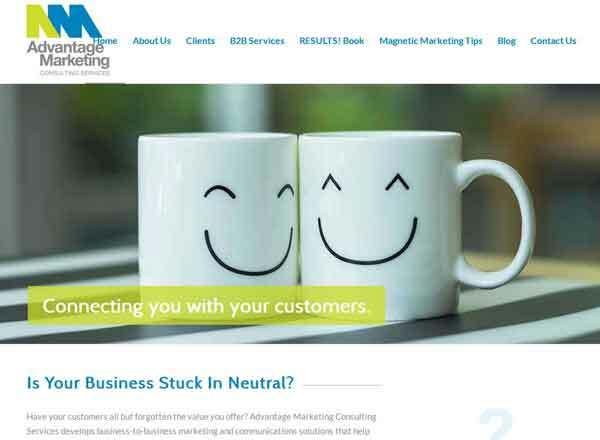 That provides a convenient dashboard where you can enter all of the kinds of information Google says is important and synchronizes it across about 70 local search engines, directories and apps, including the essential Google My Business. It also presents you with all your reviews so you can effectively manage them. If you’d like to see how well or how badly you show up among local citations, run a free scan for yourself. Thoughts? Comments? Start or join the conversation below. Do you find this information useful? If so, please Like or Share with the buttons above and on the left. Need help with your local visibility? Rank Magic can help. All small business owners want the same things: profitability, growth, and customer satisfaction. Regardless of the type of business you own or the current size of your company, you can probably agree on this. In today’s world, it’s not enough to have a local business with an office; you need to have an online presence and rank higher on Google, Yahoo & Bing. Creating a search engine friendly website for your business is the first and most essential way to accomplish that. With the growing popularity of social media, it’s also a good idea to create business profiles on the most important outlets, link them to your website and maintain an active presence there. You need compelling calls to action, proper heading tags, and contact forms to increase conversion, make it more search engine friendly, and make it easier for your potential customers to contact you. Your website should have an appropriate sitemap and clean and easy main navigation. These things are important because they’ll make it easier for the search engine to index your website’s pages and for your customers to easily find what they need on your site. Contact and feedback forms are important to maintain customer satisfaction and often lead to return business or referrals. There are several other aspects to consider; things that are not required but may still be a positive addition to your website. 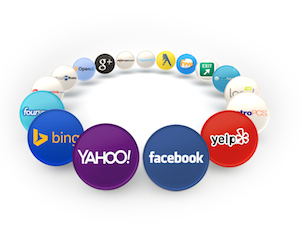 Features like a search function, FAQ page, and social media sharing buttons are just a few examples. Here is a helpful infographic by 99MediaLab, on 50 features every small business website should have. This should help you create the most efficient, user-friendly, and appealing website possible. 50 things your small business website needs to have. Having trouble with this or explaining things to your webmaster? Rank Magic can help. Please add your thoughts or questions in the comment form below. If you liked this post, please consider sharing it with the buttons above and on the left. Sliders are an increasingly popular technique on websites. You know, the rotating images with compelling marketing text that scroll across the top of a web page. Four or five seconds of one marketing message or feature promotion followed by four or five seconds of another, and so forth for anywhere from three to a half dozen or more before the rotation starts all over again. Many websites do this on their home page, but some sites repeat the same slider progression on just about every page. For one thing, images contain a lot of bytes, and the more images on a page, the longer it takes for the page to appear on a customer’s browser. If your page takes two or three seconds to download, that’s not a problem. But if it takes five to ten seconds to download, impatient or time-stressed customers may well bail on you before the page finishes loading, and go back to the search results to find a better page. When that happens, you’ve lost the customer. Another concern is that customers almost never see anything past the first or second slide in your sliders. They may look at the first one for a few seconds, read it or even click on it for more information. But customers who are looking for what you promote on the second slide or the third may never see them. Why? Because they’re in a hurry and want to see if you provide what they need. So they scroll down your page quickly, moving the slider up and out of sight. They may never even realize it was a slider with more information than they absorbed in the first three or four seconds on your page. It’s no wonder that research demonstrates very few people ever click on any slide past the first one. Research has shown that you have less than three seconds to convince someone they’re in the right place. That means most people are deciding whether to stay on your site before your second slide ever appears. 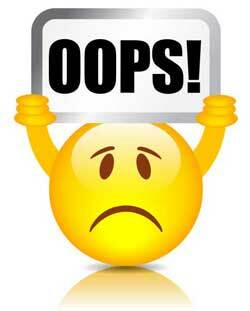 Sad, but true: having sliders on your pages runs the risk of sabotaging your search engine visibility. One of the more recent and increasingly important ranking factors at Google is page speed: how quickly your page downloads into a visitor’s browser. This is so important that Google has published a page to help you understand your page speed and how to improve it. Beyond that, when someone is looking for information you cover in later slides that they just don’t see, they are inclined to hit the back button to select something from the search results. When they do that, that’s called a bounce, and that, too, is a negative ranking factor. There are a number of alternatives to sliders that don’t carry problems for your rankings and conversions. This is like it sounds: one image made up of other images or pieces of them, or a number of separate, static images on your page. A static image with either a contact request form or a call to action can be very effective, too. If you’ve got sliders on your site, consider replacing them with one of the alternatives above. It just may help both your search visibility and your conversion rate. Questions? Opinions? Please share them in the comments below. Are you still struggling to get found on the web? Rank Magic can help. It’s been coming for years, and Google’s Amit Singhal reports that last summer, the number of Google searches from smartphones exceeded the number of searches from desktop computers and tablets combined. 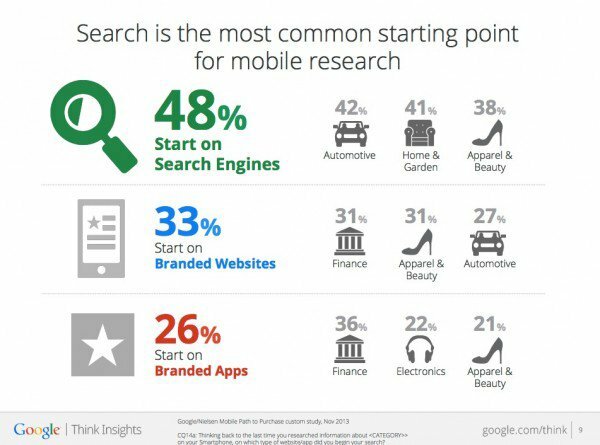 Part of the reason for that may be that search is the most common starting point for mobile research. More than 80% of Internet users own a smartphone. 89% of participants in a survey admitted to searching for a local business on their smartphone once a week or more, and that was almost three years ago. I suspect it’s even higher today. 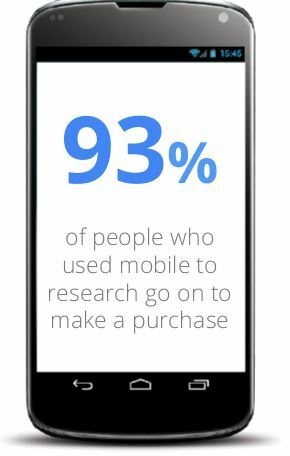 93% of mobile searchers made a purchase, according to Google. 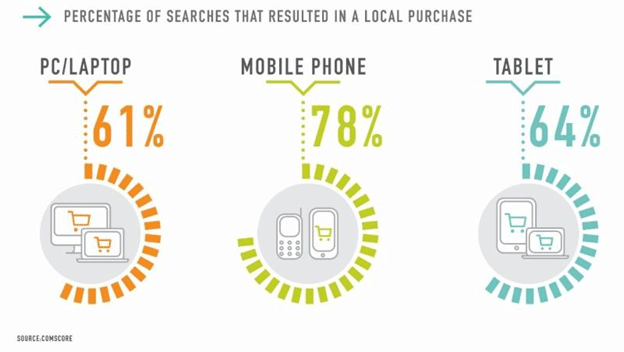 78% of mobile searches for local business information result in a purchase. That’s higher than from any other kind of device. If your business is focused locally — you deal with your customers on a face-to-face basis — you need a mobile-friendly website. If you’re not sure how mobile friendly your site is, look it up on your phone, or check it with Google’s mobile friendly test tool. If your site isn’t mobile-friendly, you will not show up as high when people search from their phones, and you may not show up at all. If your business is local, your website needs to be mobile-friendly. When people search locally, local directories and mobile apps are showing up more than ever before, as a result of Google’s Pigeon update. If you’re not showing up in those local sites, you’re missing out on potential business. You can check out how visible you are there with our handy scan. And if you need to improve your local visibility, Rank Magic can help. “Near Me” Searches – How Do You Show Up? 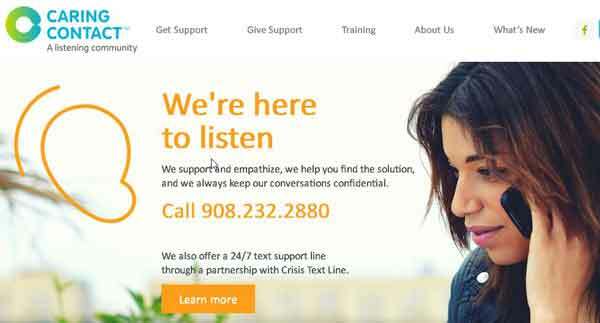 Is Bing Penalizing You for Not Being Mobile Friendly? 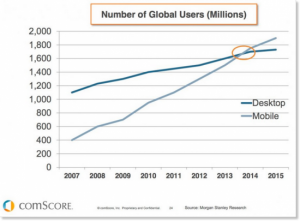 More people now use mobile phones than desktop computers. The dramatic increase in use of mobile devices requires you to control the user experience of your website on phones as well as on computers. Google implemented its ranking penalty for non-mobile friendly sites last April. Since then, Bing has started showing mobile friendly labels in its search results and has started to roll out its own ranking penalty for sites that aren’t mobile friendly. Bing is now penalizing sites that aren’t mobile friendly. Bing is paying so much attention to this that they’ve developed a quick web app that will tell you whether Bing considers your web site (or a specific web page) is mobile friendly. 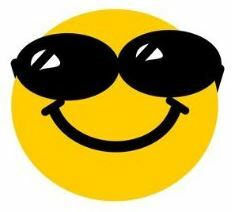 Just copy and paste your URL into their tool here. Just for good measure, you might want to test your pages at Google as well. If your website fails Bing’s test (or Google’s), you need to fix that now. That’s especially important if you’re a local business, but more about that another time. Let us know how you fare in the comments below.